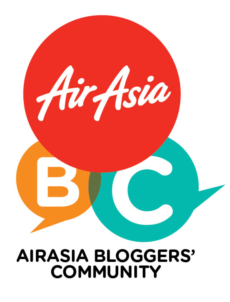 So many new cafes and makan joints have opened up all within vicinity of my house and each weekend, I am spoiled for choice over which new coffee and dessert joint to try. 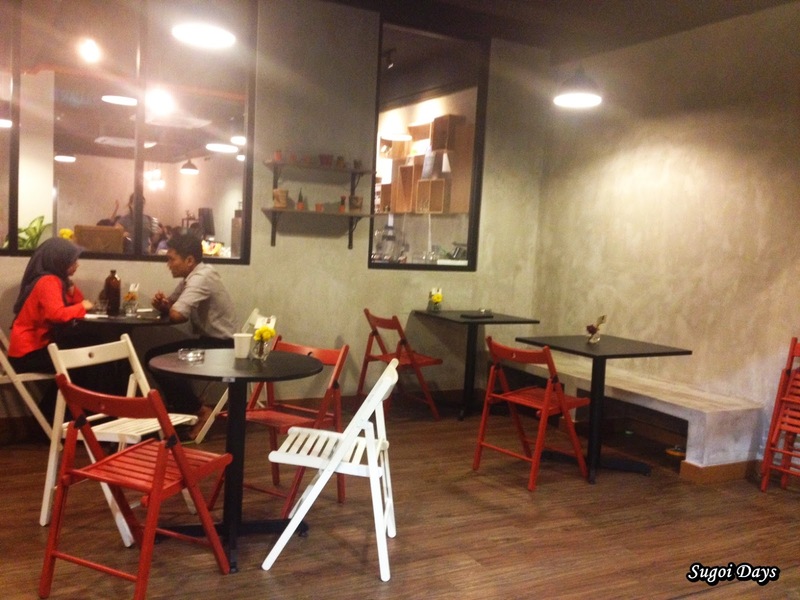 This week, that joint would be Strangers at 47, located in Section 17 along the same row as Kanna Curry House. 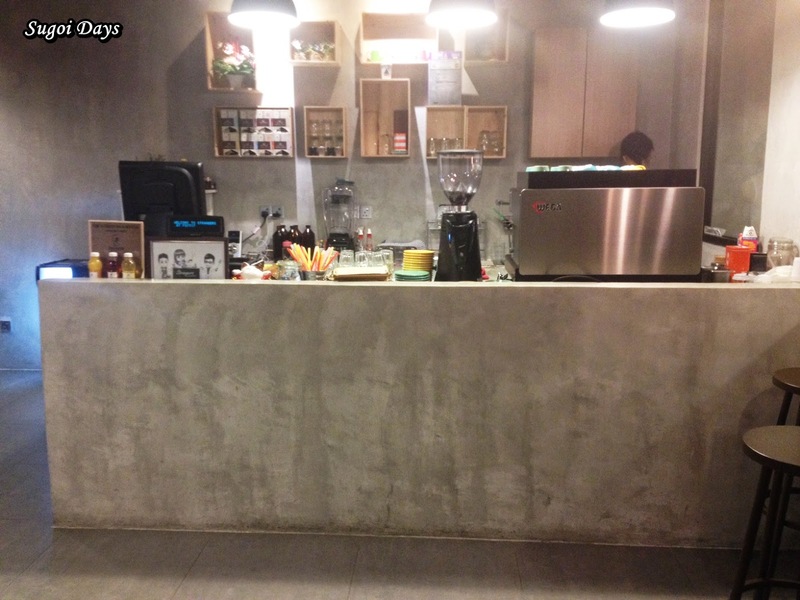 Cool cement walls and wooden furniture offered up a cosy feeling. I learnt that more wooden fixtures were added to be the interior two days after my trip there. 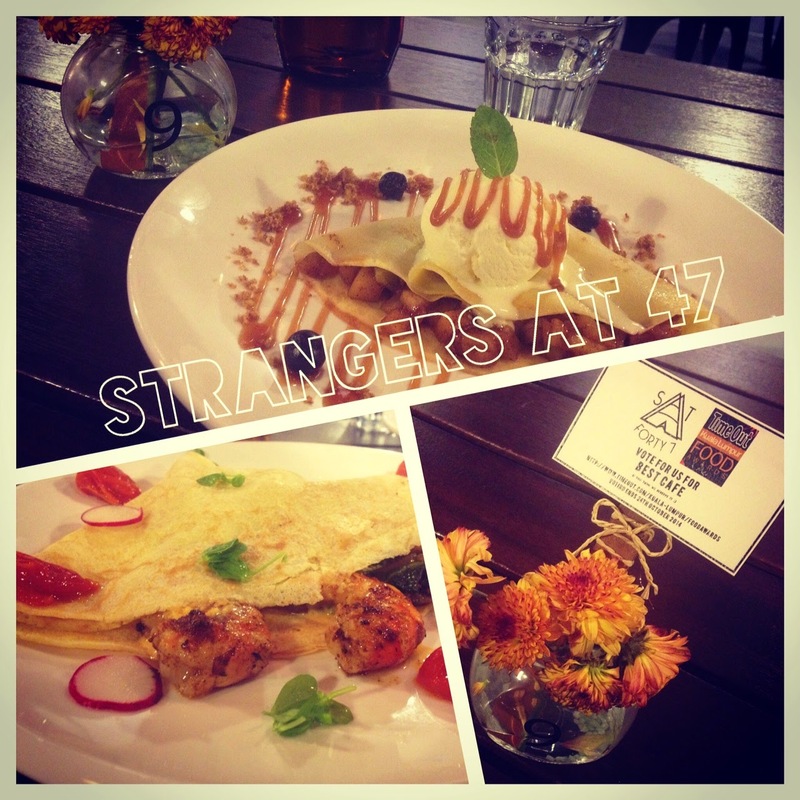 Strangers at 47 specialized in crepes. 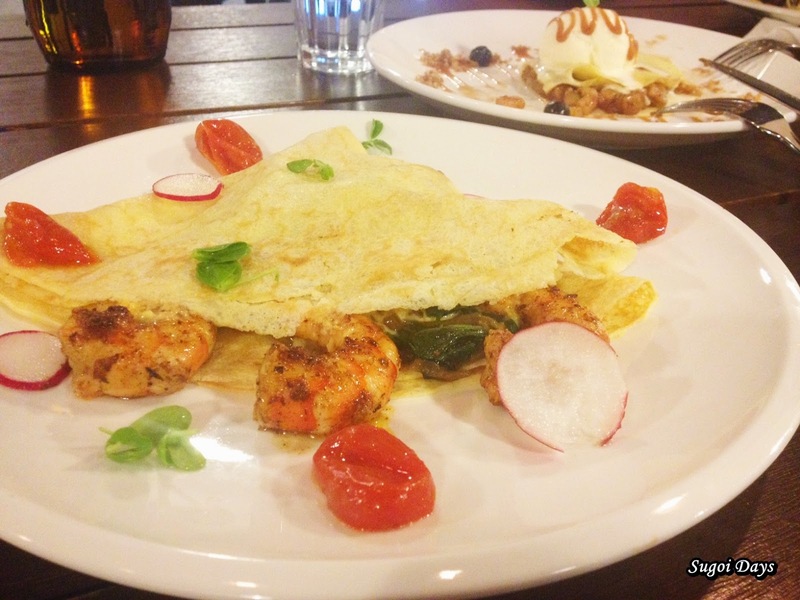 Savoury crepe, sweet crepe, they have it both ways and the crepes are to die for. 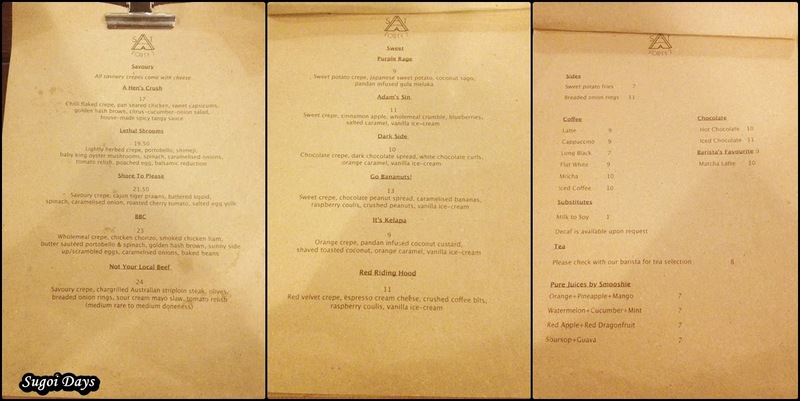 The menu is rather simple (for now) with limited dishes and drinks. 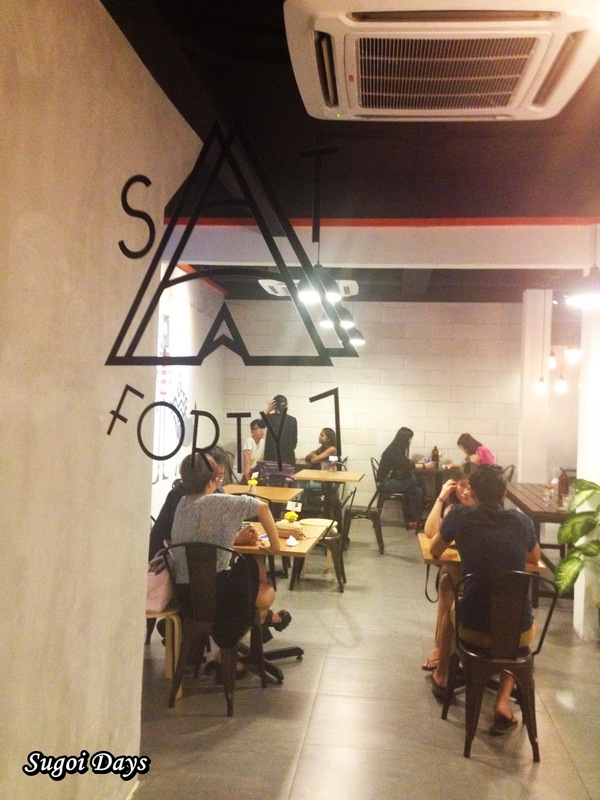 Keeping the menu simple and with limited selection works in the favour of many of these new cafes as it allows them to ensure that their food quality is consistently up to par. As of now, Strangers at 47's menu consist of only three pages. Wanting something not too heavy or too rich, I quickly decided on their Shore to Please (RM21.50) and indeed it sure did please me. The deliciously light crepe served as a base for the nicely portioned toppings consisting of tiger prawns, battered squid, caramelised onions and salted egg yolk. The prawns were fresh and crunchy and caramelised onion and cherry tomato gave each bite a hint of sweetness. The battered squid was hidden well inside the folds of the crepe along with a generous helping of spinach. 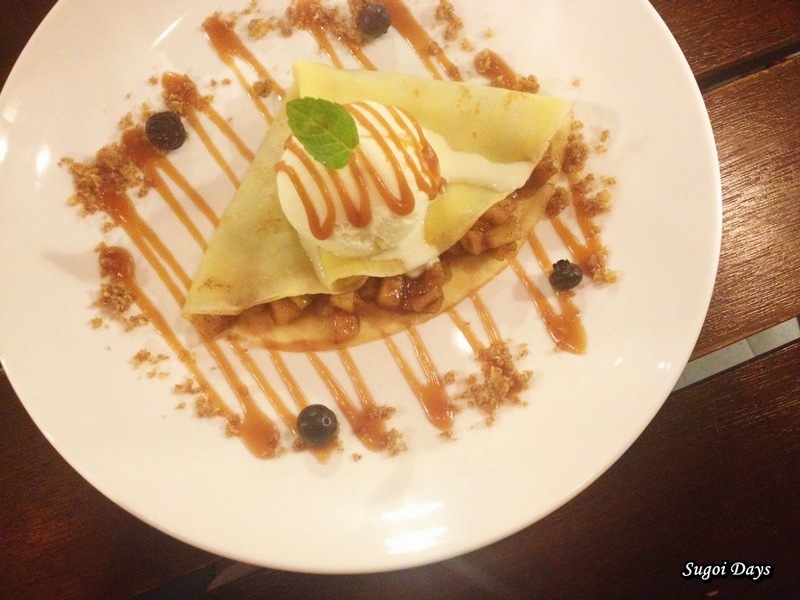 The salted egg yolk was evenly spread across the crepe further enriching the taste of the dish. I could never resist the delightful combo of apple and cinnamon and that was exactly what Adam's Sin (RM11) was. Simple, delicious and simply sinful. Wholemeal crumble gave the dessert a nice texture and the blueberries offered a sour break from the mix of sweet and salty from the cinnamon apple and salted caramel. The smooth vanilla ice-cream atop just summed up the entire dessert crepe perfectly. Sadly I didn't get to try the coffee this time round but fret not. I will be back because good crepes are just so hard to come by. Psst, I heard that adding cakes to their repertoire of desserts are in the works too. More to look forward to in the future. 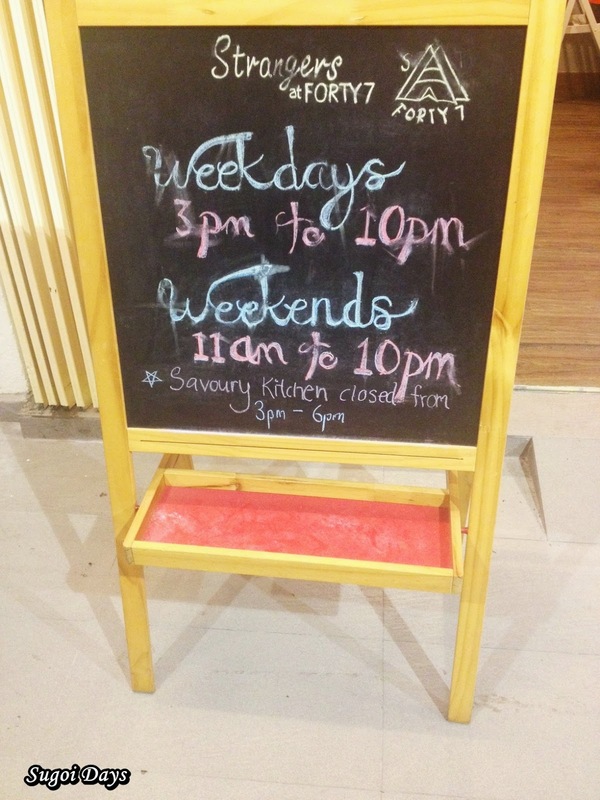 Opening hours: 3pm-10pm on weekdays & 11am-10pm on Saturday & Sunday. Closed on Tuesdays.